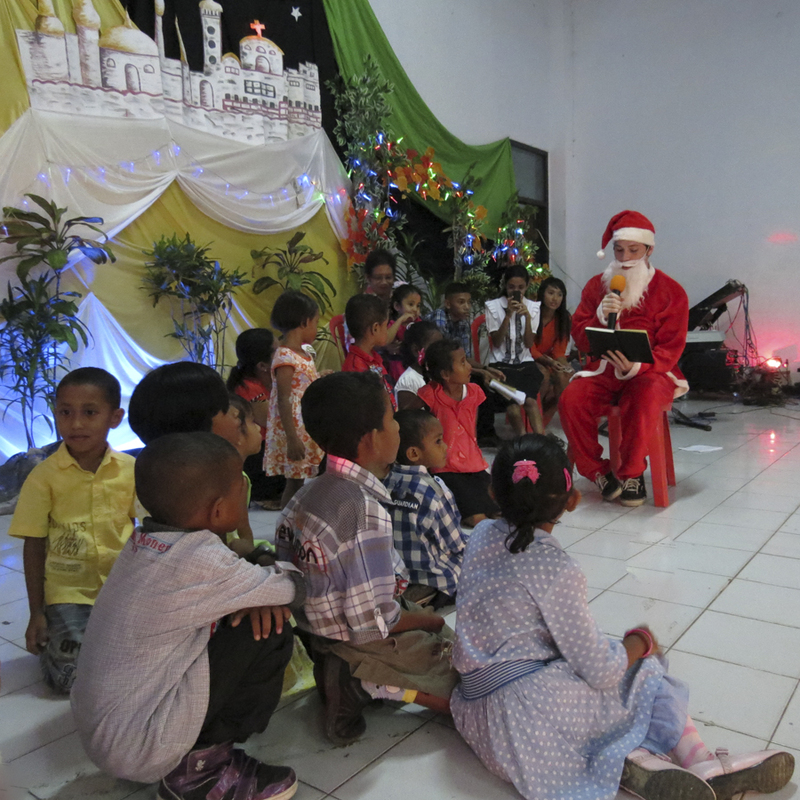 I stood behind the stage and adjusted and readjusted my white beard and red cap and wondered how I ended up here: A 23-year-old recent college graduate outfitted — and overheating — in a full Santa Claus costume in Masohi, Indonesia. It seems that people here feel that if they know a white male he must surely be Santa Claus for Christmas. Apparently, the previous two Fulbright English Teaching Assistants in Masohi had donned the costume. So, when the teachers and administrators asked me to play the part of Santa Claus at SMAN 1 Masohi’s annual Christmas celebration, I obliged. “You’d be the thinnest Santa Claus I’ve ever seen!” my parents exclaimed after I told them that I would be dressing the part. Most Christians in Indonesia’s Maluku province were converted to Christianity during the Dutch occupation, which spanned from the early 17th century until World War II . Along with their other Yuletide traditions, the Dutch brought with them the tradition of Santa Claus, whom both the Dutch and Malukans refer to as Sinterklaas. He is often accompanied by Zwarte Piet, Sinterklaas’ black-faced helper who sometimes threatens and torments children to get them to behave. The school offered to have my very own Zwarte Piet accompany me, but I requested to work solo so as to keep the tone upbeat and avoid perpetuating potentially racist stereotypes. It was barely a month into my stay in Maluku in September when I first started to hear Christmas music. “Jingle Bells,” “Santa Claus is Coming to Town,” and “O Holy Night” blasted from speakers throughout my entirely Christian neighborhood, sometimes waking me up at 6 a.m. I frequently noticed “Merry Christmas” signs, in English, and fully decorated, albeit fake, Christmas trees in homes. “It is never too soon to start preparing for the ‘coming of our Lord,’ people would respond when I asked why they had set up their decorations so early in the year. Some responded that they had never taken them down in the first place. By early November, Christmas music hit the radio airwaves, government buildings, malls and shops of Ambon. Considering Maluku has a tropical climate and that most people here have never seen snow, hearing “Let It Snow” and “Winter Wonderland” in Maluku offered constant amusement. My neighbors tend to be very enthusiastic about their faith and celebrating Christmas is the religious highlight of their year. Christmas becomes a spare-no-expense occasion when families reunite, eat feasts, and exchange gifts. On the evening of December 19, SMAN 1 Masohi held its Christmas celebration. The event began with songs and prayer as students and teachers entered the events building. Students and teachers caroled “Come All Ye Faithful” and “Joy to the World” in bahasa Indonesia, while I simply hummed the tunes. Following the Malukan tradition, the school choir sang song after song, including “Feliz Navidad.” Other students recited original poetry. And then came the time for my Santa Claus debut. I was brought behind the stage and presented with the Santa Claus suit. After a few minutes of mental preparation, I was thrown out on stage to thunderous uproar and applause. The sight of their American-born English teacher dressed as their beloved Santa Claus made the teenage students of SMAN 1 Masohi react with unrestrained excitement. I was handed my book and asked to read a Christmas story to the children of the teachers and administrators. Earlier in the day, Ibu Vonny and I had prepared a loose adaptation of “The Night Before Christmas” in Melayu Ambon (the local language) to read to the children. We took out most references to winter and snow. Later, I presented each child with a gift, provided by their parents, and a small bag of sweets. As each child approached the strange, foreign-looking man with the long white beard and funny red cap, they became speechless. Some of the children were excited to see Santa Claus. Others were absolutely terrified. Some of the older children knew that it was Mr. Ben underneath the red hat and white beard. The next morning, I hopped on the boat to Ambon and spent my Christmas and New Year’s vacation in Singapore with my parents and siblings. Needless to say, I left the suit, white beard, and red cap in Masohi. I think my Santa days may be over, at least, until I’m a jolly old man with grandchildren to entertain. Or who knows? Maybe I can parlay this into a yearly gig.